Penguin Random House Children's celebrated Allan Ahlberg's 80th birthday (the actual day was 5 June) with a buffet lunch for his friends, family, illustrators and publishers. 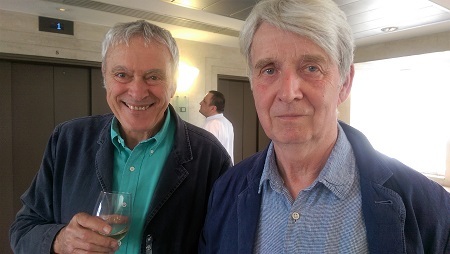 The party also celebrated publication of Ahlberg's new picturebook Baby on Board, illustrated by Emma Chichester Clark, and the 40th anniversary edition of his and his late wife Janet's classic Each Peach Pear Plum. 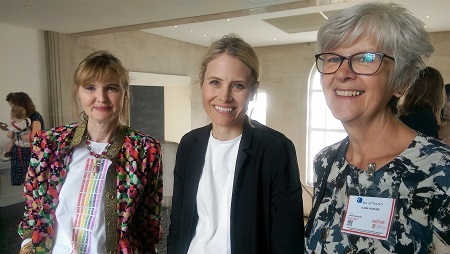 Among the guests were Ahlberg's daughter Jessica with his third grandchild, 1-year-old Phoebe, as well as illustrators Michael Foreman, Bruce Ingman and Emma Chichester Clark, and journalists Julia Eccleshare and Juliet Rix. Ahlberg spoke movingly, and humorously, reading out poems about the moment of his adoption, and about telling a story to his grandchildren. 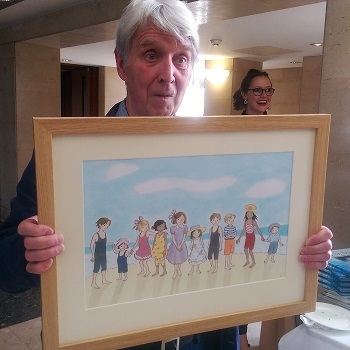 The guests sang Happy Birthday, and he was given an original illustration by Emma Chichester Clark from Baby on Board, as well as a card in the style of The Jolly Postman, with an envelope in the back containing postcards bearing messages from guests and absent friends. Photos: (top) Ahlberg with gift; (left) with Michael Foreman; (below, from left) PRH Children's md Francesca Dow, publishing director Amanda Punter, and former Puffin marketing director Elaine McQuade.